El Niño is almost ready to give way for the rise of its cold counterpart, La Niña. But before it goes, it has one more tough weather hit to throw at the US: a bizarre combination of flooding and an ever-intensifying drought. 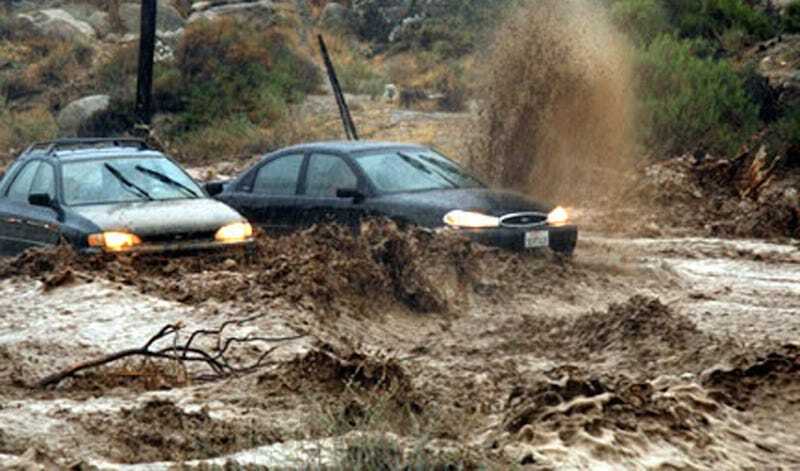 NOAA’s spring forecast was just released and, although El Niño will be wrapping itself up by the end of this season, it still has a few more tricks up its sleeve—particularly with flooding. Part of the problem will be due to the heavy rain and snow the US has already received (we just wrapped the wettest December ever recorded) but more heavy rainfall is expected to drench the country with periodic, torrential rains. This means that we can expect not just slow rising rivers and streams but widespread flash flooding. With all this rain, it seems we’d finally start to see some drought relief across the country, especially in California. Instead, El Niño will manage to bring mostly the opposite. How? The East will be seeing floods, but that rain won’t extend west. Northern California and its direct surroundings have gotten a bit of a break from El Niño’s rains, it’s true, but unfortunately that’s more than balanced out by drought gains to the south. “Over the last four years we’ve dug a very deep hole, missing between one and two years of precipitation,” Rob Hartman, hydrologist-in-charge for NOAA, told Gizmodo. “To ease the drought in any meaningful fashion, we’d need 150 percent of normal precipitation. We’ve come close in some areas, but some areas have been below average, which makes the hole even deeper.” In other words, yes, El Niño is weakening—but even a weak El Niño means more weird, terrible weather to come.